There will always be a low profile chef with great talent and achievements out there, but my mind quickly set itself upon Stefu Santoso, one of the architects behind AMUZ success in Jakarta culinary scene for the past few years. It was probably last year or perhaps two since the last time I met the chef and finally we can meet again on a venue that showcases the best of his current project with the group. Managed by AMUZ, The Energy Cafe is among the few restaurants found inside the mezzanine level of Energy Building.It was way past the lunch time but some people still linger of coffee and ice cream and the chef approaches me in cheerful manner. We quickly catch up with what has happened for the past few years and started talking about him. 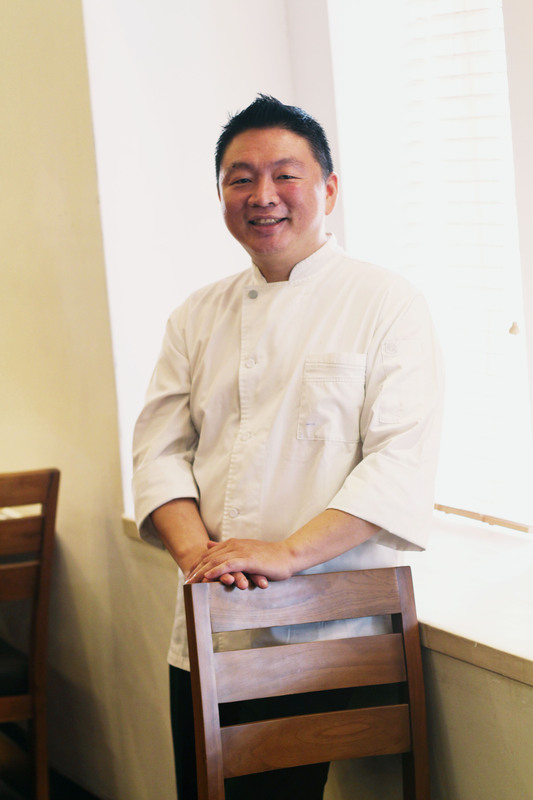 Chef Stefu Santoso started his career from a scratch. Once he graduated from the tourism school run by Atmajaya, he began his kitchen career in Hotel Menara Peninsula but he paused his run for the formal career to help his relative’s food business. After some time, he started his career all over again at RIVA of The Park Lane Hotel. “My career is pretty straightforward and I never had the experience abroad, even for a brief spell”, he says. However, he climbed up from the very bottom as Commie under the tutelage of the eminent Chef Gilles Marx. He has since become his trustworthy captain and shows his true capability in the kitchen. “Chef Gilles left RIVA after his several years spell and then Chef Eric Guilbert took over the command. Under these two chefs, my proficiency in French cooking techniques were developed immensely”, says Stefu. Years after, Chef Stefu was given a higher responsibility at the hotel and deals mainly with the busy banquet section. Knowing him since the beginning and the talents that he had developed, Chef Gilles Marx approached him to join his private venture with AMUZ. “It was an offer that I would gladly accept. Not only that we became good friends, he also taught me a lot and over the time, we complete each other in the kitchen”, Stefu reminisces the moment. Together with the advent of AMUZ, he plays his main role well by helming the catering division, APREZ. “The Energy Cafe becomes our showcase of what we actually offer at APREZ and customers can enjoy the all-you-can-eat course from appetizers to dessert for an affordable price”, says Stefu. In-between his busy schedule running the catering for corporate and private events for the VIPs, and also by maintaining the whole business with Chef Gilles and Chef Alexandre, Stefu is still able to keep a healthy schedule with his family during the weekend. “After the church in the morning, I usually go out with the kids to eat outside. Well, I rarely cook back home but if the kids want me to cook then I will do something simple but special for them”, says Stefu. Apart from that, Chef Stefu quite recently took over the presidential role of Association of Culinary Professionals Indonesia from Vindex Tengker. “Within the association we have a schedule here and there frequently. Yearly, we also organize Indonesian Salon Culinaire. Please feel free to come”, asks the chef.